The What: C2G’s HDBaseT extenders are ideal for extending either HDMI or DisplayPort digital audio/video signals up to 300 feet at a 1080p resolution over a single Cat5/Cat5e/Cat6 unshielded twisted pair network patch cable. The What Else: The offering is robust and boasts unique features that enable customization of the extension solution to meet the needs of the installation environment including interoperable wall plate and box options for transmitters and receivers. In addition, the rear cable connections for the category cable and optional serial cable of the wall plate extenders are set at 90 degrees, making that connection in a wall box easy. The thin design of the electronics on the back of the wall plate make for a comfortable fit in the wall box. 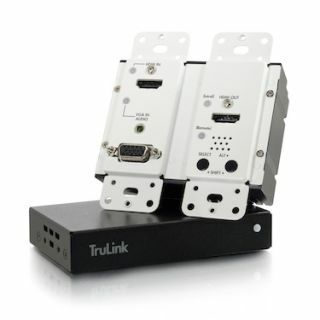 C2G’s unique power option, TruChoice power, allows power for the entire solution to be supplied over the category cable to both the transmitter and receiver from a single power adapter placed at either the transmitter or the receiver end of the solution.